I’ve been dreading coving the corners on my layout but really think that the curved corners look much better to both the eye and camera. In the past I’ve used Masonite (hardboard) to cove the corners on my previous layout but it is a little difficult to work with when doing tight radius such as I’m doing on my new railroad. And then I read Charlie Comstock’s article “Bending the Sky” in the May 2013 edition of Model Railroad Hobbyist Magazine and I was intrigued! I acquired the styrene (I am using .060″ where Charlie use .040″) and emailed Charlie with a few questions which he promptly answered (thanks, Charlie!). Today I started the process after much stalling. For some reason I was a little scared of doing this as I’ve never done it before. The Boss (my wife) told me to “man up” and get busy. I had originally planned on coving the corners from the top of the layout to the ceiling but started doubting myself thinking that the long skinny pieces of styrene would be cumbersome to handle. 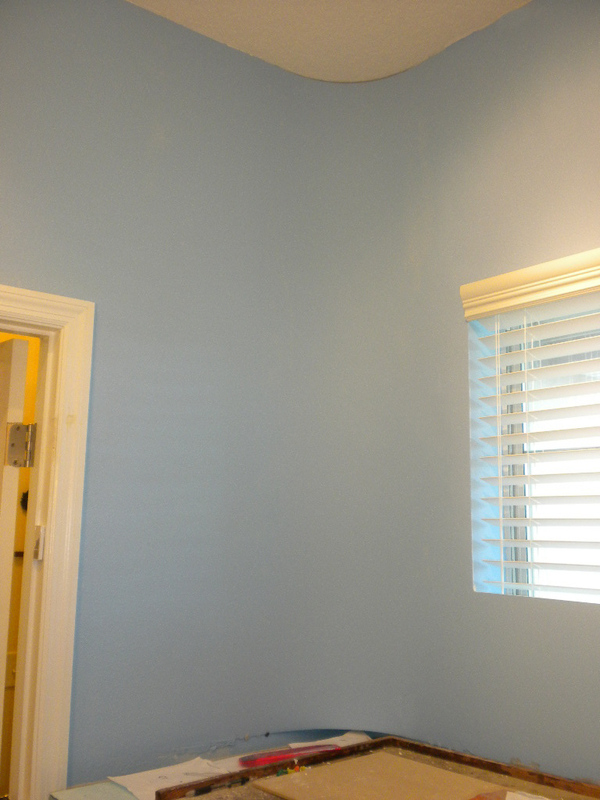 I thought about only coving up to the “backdrop level” but I don’t even know what that is yet! If I only coved part way up I think that it wouldn’t look as nice and I’d have to “cap” off the tops of the curves – another step. So back to my ordinal plan of coving from benchwork top to the ceiling. The picture below shows the first piece of styrene in place held by push pins. I’ve decided that it would be much easier to paint the corner pieces before installation so I’ll go ahead and take this piece down, cut the others, and paint the batch. You are doing a great job on the layout room. If this is an indication of what the layout will be like we are in for great time! Thank you for your kind words. I’m having a ball working on my railroad and hope that I can create something that is fun and also interesting to others. Hey! The corners look great! Nice and smooth. Really nice work, and the additional efforts you’re taking to share it are much appreciated. Thanks for the link to the original article – it looks like you used a different strategy for the staples. It looks like an excellent idea – did you leave the staples in place to act as blocks to hold the styrene? Have any cracks developed along the seams? Jeff, I appreciate your kind words and I’m glad that you find the information helpful. My first corner still has the staples in place and I’ve had no problem with rusting. The other three corners I switched to using CA to hold the styrene to the wall. I tested it first on a piece of my wall in the garage and it worked great. With my test I tore off the piece of styrene that was CA’d to the wall and it actually ripped off the drywall paper! 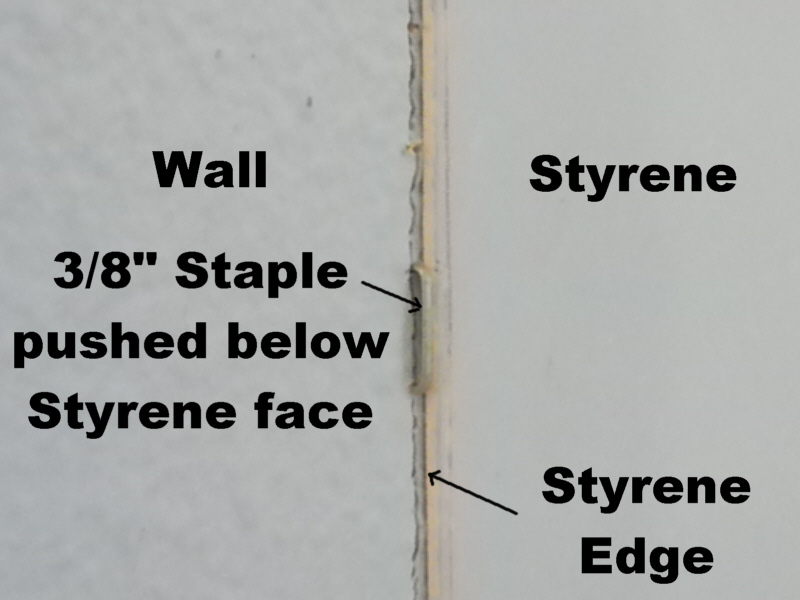 Once the drywall mud is in place it will actually do the job of holding the styrene “sprung” in the corner. Thus far I’ve had no cracking or any other problems with the seams. I love the Styrene idea. Thanks for sharing it. I was planning on Masonite, but as my wall studs are not equal distance from the corner on each side of the corner, and different in all 4 corners of the room, it would be a pain trying to insert new studs for attachment. 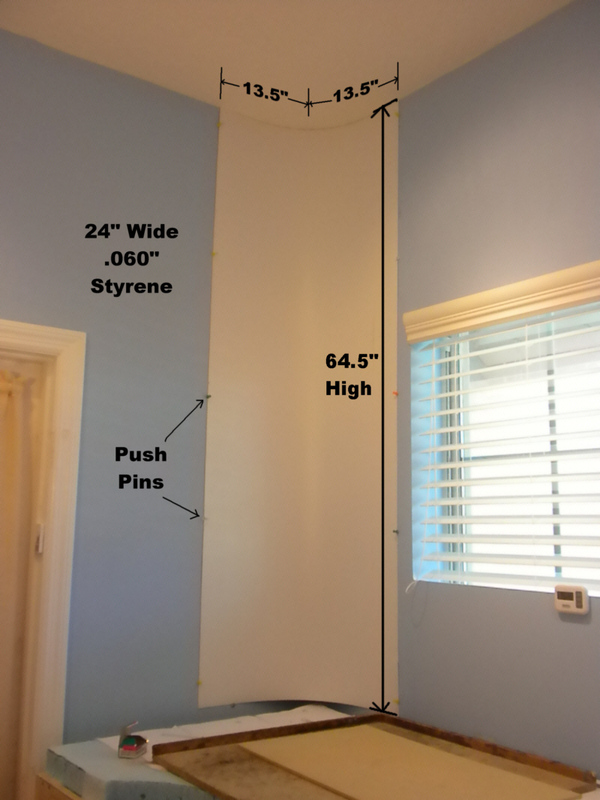 I do have one question though; How do you get a smooth joint with the .60″ styrene laying on top of the sheet rock ? It seems that there would be a bulge in this area. Paul, Thank you for your comment. As far as the question about the joint between the styrene and the drywall I just used some drywall compound to feather out the joint. After applying it and letting it dry I sanded the joint with 120 grit sandpaper.